Home » books » Roald Dahl – What Was He Thinking? Roald Dahl – What Was He Thinking? I remember reading those chilling words from a collection of short stories, when I was in grade school – my first introduction to the macabre stories of Roald Dahl. Much later, it was hard to reconcile the thrilling Tales of the Unexpected with the creator of Charlie, James, Matilda, and my favorite BFG (Big Friendly Giant). In his biography of Storyteller: Roald Dahl, Donald Sturrock introduces a literary giant – both literally (Dahl was six-foot five) and figuratively (although Dahl never won prestigious writing awards). The life that inspired his characters – like the man – was never boring. If you are a history lover, you will appreciate Sturrock’s ease with famous events and people, making them all the more interesting because of their relationship to the quirky, strange, and funny man who lived through them to write all those wicked stories. Be prepared, however, to curl up with this book for a while – it’s over 600 pages, with footnotes and references, but worth it to peek inside the psyche of what made this writer write. 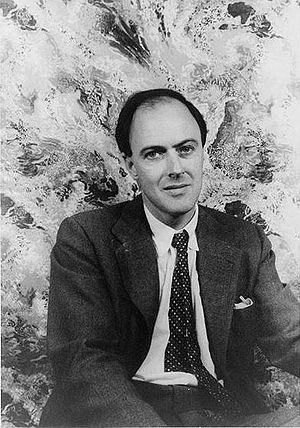 Most of Roald Dahl’s short stories are in the public domain; if you haven’t read any, the link for “classic shorts” below has two of my favorites – from before he became a famous children’s book author. This entry was posted in books, reading and tagged Charlie and the Chocolate Factory, James and the Giant Peach, Matilda, Over to You: Ten Stories of Flyers and Flying, Roald Dahl, Royal Air Force, World War II. Bookmark the permalink.